Season: All year round, daily. Duration: 3 - 3,5 hours. Experience the incredible feeling of walking on ice. Glacier walk is a great glacier adventure. 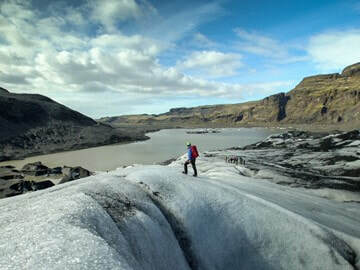 The walk takes place on Sólheimajökull glacier, part of the Mýrdalsjökull ice cap, close by the south coast. The walk from our base to the glacier takes about 15-20 minutes and takes you through a varied landscape, formed by the glacier over thousands of years. On the way it’s possible to see how rapidly the glacier has melted over the last 15 years. After a safety briefing and a lesson in ice walking, we start our walk. We will walk in amazing terrain, over crevasses, sinkholes and ice ridges, experiencing the unique glacier environment. ​Difficulty: No special skills are required. The glacier walk is suited to people in generally good health. Please bring ​warm clothing and something waterproof to wear and good walking shoes.